This was the final week of my sampler and some of the most interesting techniques had been saved until last such as painting with silk thread, rolling and overlapping ribbon in a circular design and using the chain stitch to fill an oval motif. Creating relief was really enjoyable and there were two techniques shown for this one with tube beads and leather and the other with sequins and beads. 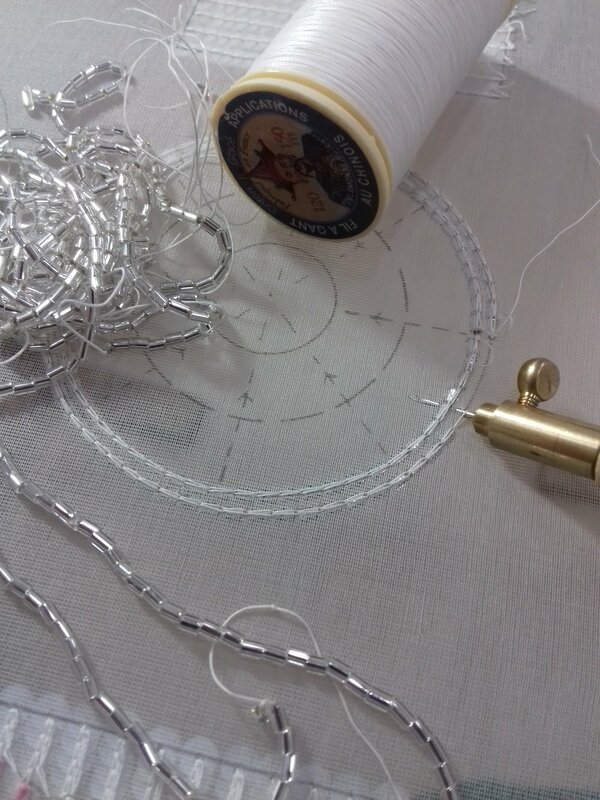 An outline of the shape to be filled is created and then rows are marked using a loose chain stitch. Next the pulling stitch is used to fill in the areas and as each row is completed the stitches of the following row are inserted into the stitches of the previous row. This creates an overlapping or blended effect, as if you were painting with the stitches. This was the final part of an exercise that began with applying tube beads in concentric circles, followed by applying tube beads in tapered rows using the point-tiré and adding sequins in a river. I found it tricky to roll and overlap the ribbon with even tension but most of the mistakes were hidden by the jewel that was added at the end! The areas to be in relief are marked by applying tube beads, in this case it was a circular outline and the signature letter of the Lesage logo. White leather as soft as butter was stretched tightly across the surface using pins. I was given a number 70 hook which has a thinner needle or hook than the number 80 I had been using. I was cautioned several times about the sharpness of the needle and how easy it was to accidentally puncture yourself. A chain stitch was traced around the outline of the circle and the letter as well as the negative spaces. In the absolute silence of the atelier I felt like I was making a raucous disturbance each time my hook punctured the leather! Decorative chain stitches were added afterward using gold metallic thread to highlight the letter and draw the tiny needle included in the logo. 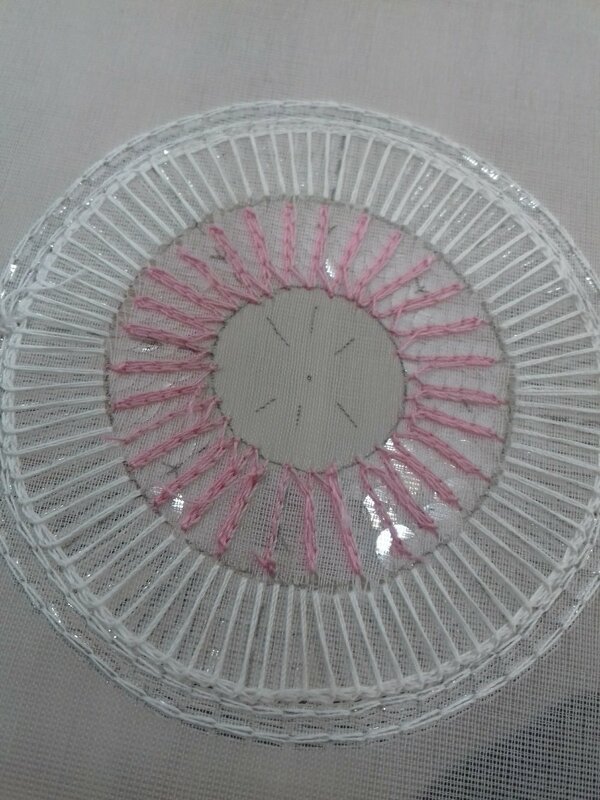 An outline of transparent tube beads finished the piece. 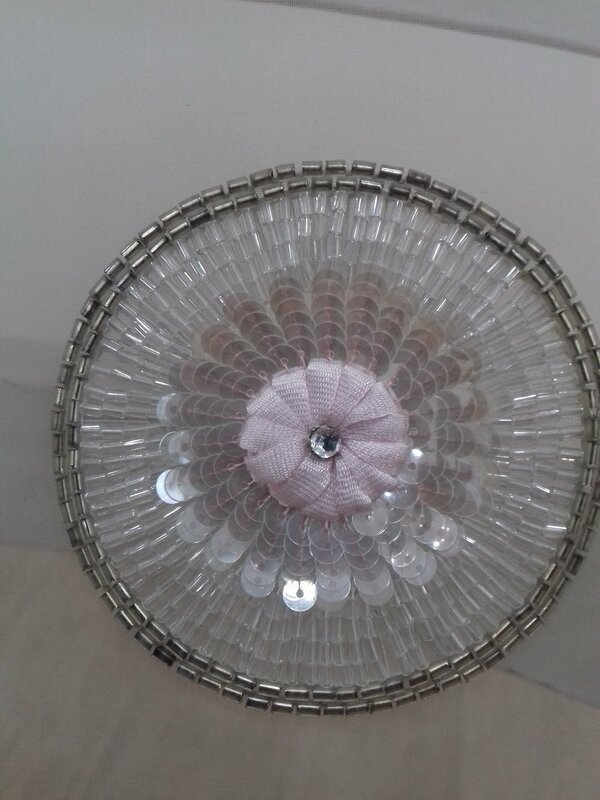 This is used to fill mainly oval or circular shapes and the chain stitch is started on the outside and then traces the outline to the inside. A tiny point-tiré is used to create a corner in a teardrop motif as you continue towards the inside. 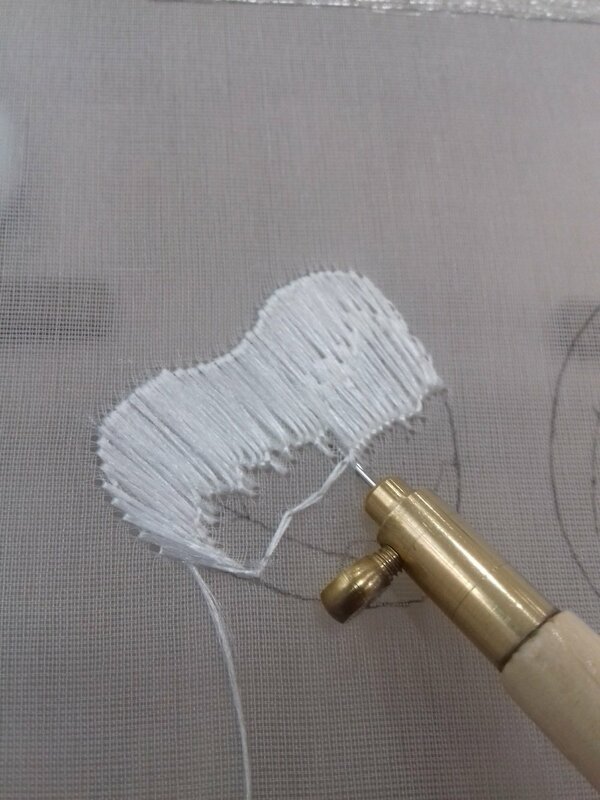 Working on the right-side, when the shape is filled you use the stopping stitch and then pull the little thread to the wrong-side using the hook. I had finally finished the sampler of techniques after four weeks of classes and homework! As I gazed lovingly at my work I almost couldn't believe how much I had learned. The teacher brought over a damp tea-towel and an iron on a very low heat and she steamed the sampler from underneath as I was too nervous to do it. She got a jar of gum arabic and spread the mixture onto her hands. Using quick strokes she covered the underneath of the sampler with the paste which gave firmness as well as fixing all the tiny finishing threads.